Six kids?! 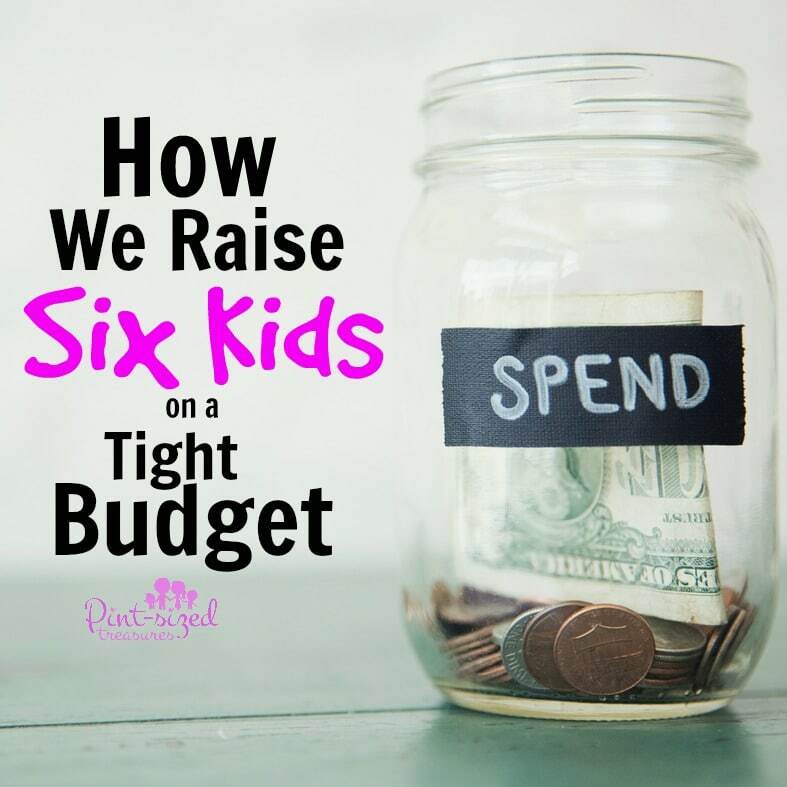 Yes, my husband and I are able to raise six adorable, lovable and extremely happy kids on a tight budget. We also raised them on one income for twelve years. We now, because of this blog, are raising them on two incomes. But, we still have to budget! When it comes to raising a house full of kids, I’ve learned one thing: it takes creativity, planning and self-control to afford to educate, feed, clothe and entertain a large family. Most people assume a large family cannot possibly provide for six growing kids unless they’re bringing in some highly envied paychecks. Yes, I said paid checks — with an “s” — because it’s plural. It is very possible and you don’t have to eat rice and beans for every meal! Now, that’s a relief — isn’t it? You don’t need a large family like ours to try these ideas. They can help a family of any size enjoy a fatter wallet — and that’s one area we all would love to gain a few pounds! Sadly enough, many parents have yet to tap into money-saving options when it comes to children. Some parents simply haven’t delved into the ideas of saving and budgeting. We’re not ashamed to visit thrift stores. I have seen women literally sour their face when I mention a thrift store or yard-sale. I LOVE finding a good deal! I have gotten many brand-new items that must have been extra or unwanted gifts at the local thrift store or neighborhood yard sale. Baby clothes are always easy to find since little ones grow out of their layettes at top notch speed. I have snagged Nike, Adidas and Sketchers brand toddler shoes for my kiddos for just a couple of dollars. There are treasures to be found, so get to treasure-hunting! We make lots of food from scratch. Those multi-flavored Popsicles look yummy, don’t they? Why not try making them at home? Since we live in a tropical climate, my kiddos enjoy chugging down shakes. They like peanut butter shakes, chocolate shakes, vanilla shakes, banana shakes, mango shakes, Oreo shakes and the list goes on. If I buy them at a coffee shop close by it is $2.00 per kid. I have six, so you’re talking $12 just for each kid to get a shake. At home, I make the shakes for $1.50-$3.00 for all eight of us! Making homemade hot cocoa, sandwich bread, soups ( we rarely buy canned) helps us keep our grocery expenses super low! Kick the canned, packaged foods and frozen foods. Save money and make healthier, tastier meals. We encourage healthy hygiene. Hygiene goes a long way with keeping kids healthy. Many childhood illnesses are a result from unhealthy habits. Encourage kids to wash their hands before mealtime, after school or any public outings. And one very big, bad habit of so many kids? Remind your kids to keep their hands out of their face! My husband is awesome about keeping tabs on this issue! We teach our kids to treat items with care. A real money-stretcher is a simple thought —- take care of the items you already own! Things need replaced less when maintained with care. Don’t allow your kids to jump on your furniture, write on the walls or throw objects. Take time to show your kids how to care for books, DVDs and toys. We believe in the “Just a dab will do ya!” mantra. This is a famous saying from my Grandma — and boy, is it a wise one. Do kids really need a tablespoon of toothpaste to brush teeth? What about shampoo and soap? For sure they don’t need a ginormous glob of shampoo slathered onto their tiny tresses! It’s amazing how much money our family has saved just by monitoring the amounts of toiletries, food and drinks the kids use. We start with small portions. After I prepare dinner, I prepare my husband’s plate and then my kids. I probably give each child about two tablespoons of the side veggie and then two tablespoons of the main dish. If the kids want more, then I give them more. But what happens if I give them a teen-sized portion and then there is uneaten, left-over food? It goes in the trash. Serving smaller portions to your kids will, in time, cut your grocery bill at least by 20%. We avoid debt. The amount of money people spend on interest alone is staggering. If we want to make a purchase, we save up for it and pray about it. We pray and budget for those items — cars, vacations, plane tickets, surgeries etc. and avoid debt as much as possible. For now, that’s been our entire marriage! We create a budget for almost everything. My husband is very studious in filling out a spreadsheet monthly with all our expenses and income. We budget for rent, health insurance, home-schooling expenses, groceries, home-schooling, traveling, utilities and even holidays. Seeing our expenses and budget side by side helps us understand what we can and can’t spend money on every single month. 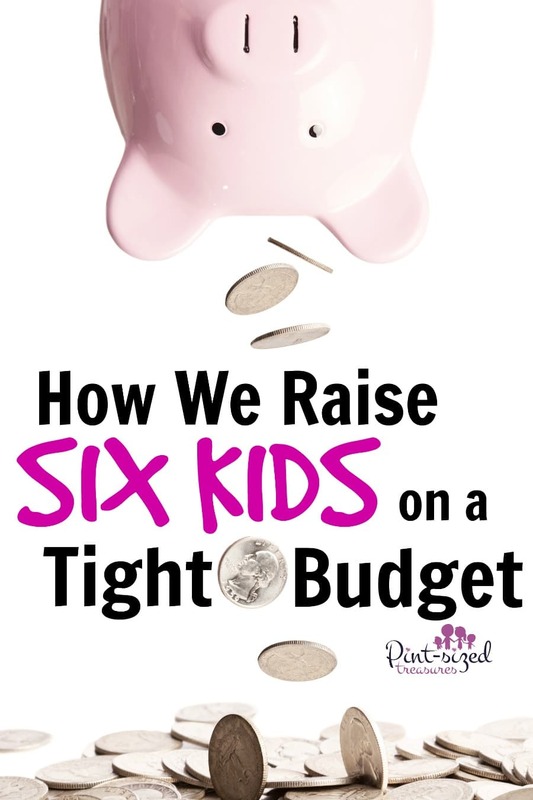 It keeps us on top of our finances so we can give our kids a financially secure childhood! Do you have any ideas to add to this list? Share them with us on Facebook!